Middleton Cleaners is a drycleaners and drop off laundry service specializing in suede cleaning, clothing alterations and wash and fold near me. Other dry cleaning services include wedding dress cleaning and preservation, suit alterations, and drycleaning for leather jackets. Other laundry services include drop off laundry service for Madison, Middleton, Waunakee and Cross Plains, WI. 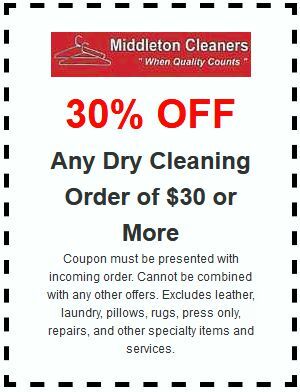 Middleton Cleaners - serving Middleton, Waunakee, Madison and Cross Plains, WI - offers a wide selection of dry cleaning and laundry services designed to keep you and your home looking your best! Coupon must be presented with incoming order. Cannot be combined with any other offers. Excludes leather, laundry, pillows, rugs, press only, repairs, and other specialty items and services. Come see Middleton Cleaners before your next "Black Tie" event for expert cleaning of all your formal wear, including tuxedos, tuxedo shirts, ties and cummerbunds. We also have the experience and extensive training to clean delicate wedding gowns and prom dresses. Along with our expert cleaning and care, we also offer wedding dress preservation services for your gown. There is nothing more luxurious than your treasured leather and suede garments. Professional Leather Cleaning and Suede Cleaning is a must. Leather's comfort, durability and versatility can make it your favorite thing to wear. Middleton Cleaners provides proper leather cleaning and suede cleaning so that your genuine leather garments can give you many years of practical wear and enjoyment. We all have our favorite pillows. Unfortunately, some people love their pillows so much that they keep the same one for far too long without cleaning it nearly often enough. Pillows aren't thought about very often. We just plump them up when we change the pillowcase or when we make the bed in the morning. Other than that, we don't pay much attention to them. Depending on how old your bed pillow or mattress pad is, more than 50% of its weight may be comprised of (sorry to say this but needs to be said) fungus, dead skin, mold, mildew, dust mites and their feces. Sanitizing your pillows frequently helps keep them fresh and prolongs their useful life. We will disinfect all feathers and replace ticking (the outer cover) with new heavy duty ticking, refilling with your original feathers. Are your pillows going flat? We will fluff them back up by adding more feathers or down. Middleton Cleaners wants you to rest easy on your pillows. Regular cleaning of your curtains and draperies lengthens the lifespan and improves the air quality in your home. Draperies act as a filter by trapping dust particles in the air. It’s essential to have your drapes cleaned, even when you might not notice how dirty they are.